On Saturday, I got muddied at the Redneck Games. 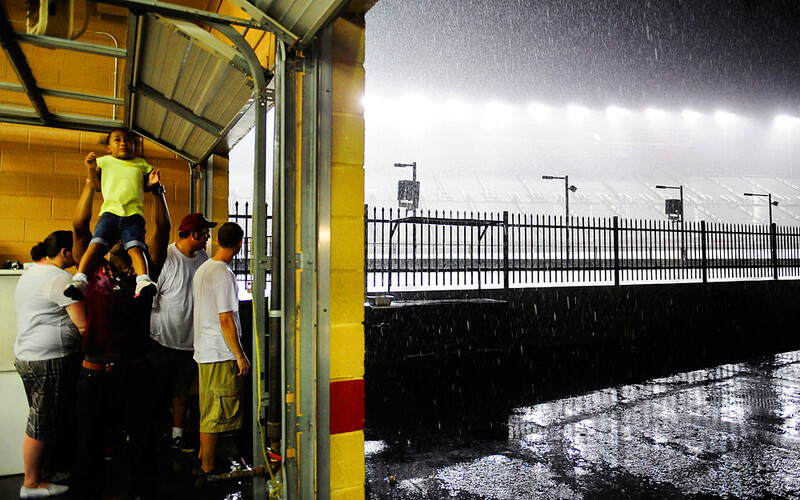 On Friday — the day before — I got soaked to the skin at the Atlanta Motor Speedway while photographing Fastlife Friday. I photographed some of the performers and a few of the vehicles in queue on the track… and then it began to rain. By the time I made it to a concession stand — the closest shelter — I was thoroughly wet and my hair was dripping buckets. But I kept making pictures. © 2010 by The Atlanta Journal-Constitution. (Click on the image above to view the full photo gallery at ajc.com.) R&B artist Justin Crowder, who performs as part of Swagg Team, lifts his 4-year-old niece Zoe Tolbert into the air and waits with others under a concession stand while a thunderstorm soaks the Atlanta Motor Speedway on Friday, July 9, 2010. The storm canceled the remainder of Fastlife Friday activities that night, including all the races that were scheduled.